Also available in Green, Silver, White, and Black. The price, performance, and durability make this one of the best nano quadcopters on the market. 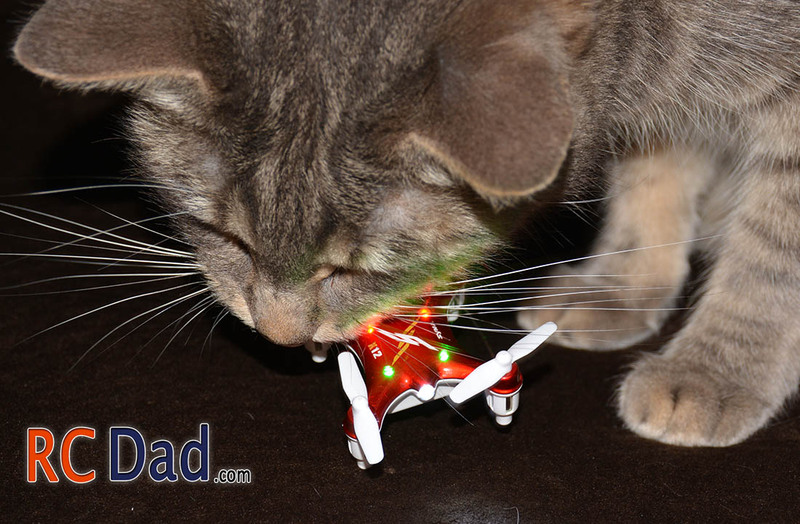 I’ve always trusted Syma and I was excited to hear they finally released a nano quadcopter. 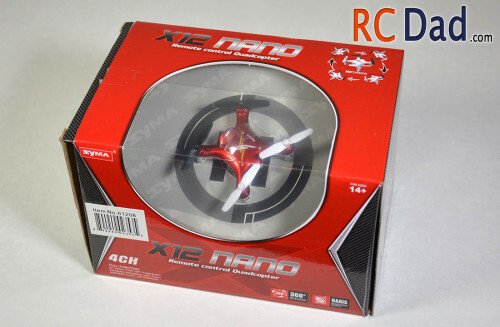 There are 4 major advantages of the X12 over other nano quads. 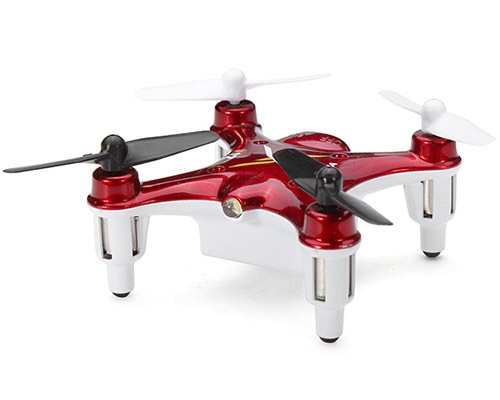 The larger transmitter, larger propellers, durable construction and a bright forward facing light. 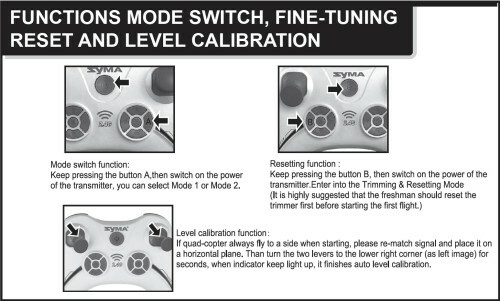 The controller fits comfortably in your hands, the trim tabs are easily pressed when in flight and the sticks have a nice rubber grip. Compare that to these tiny ones that come with the ProtoX and Cheerson quadcopters. The larger blade size means your blades don’t have to spin as fast and that’s good for a couple reasons. It’s less noisy, they don’t hurt as much when they it you, and they don’t break as easily. A big problem a lot of people have is losing or braking blades. 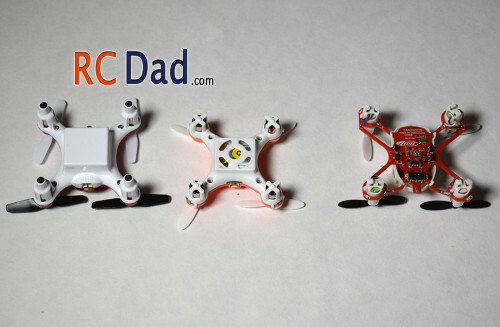 It’s common to lose blades pretty quickly flying other nano quads. After crashing the X12 over 10 times, no blades have come off or chipped. The frame is very solid. Much more so than the ProtoX , which uses its main circuit board as the arms for the motors, leaving it unprotected. The protoX flies fantastic and is extremely quick but it’s definitely more fragile. 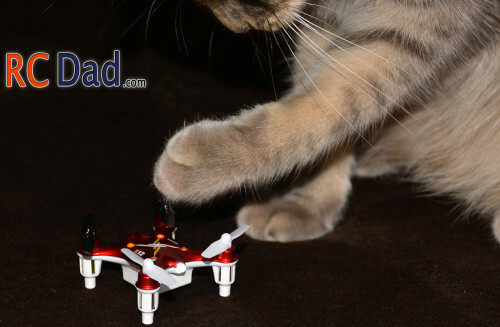 They also put rubber feet which helps grip smooth surfaces during landing and helps keep it from sliding. Size and weight are very similar. The X12 is slightly taller and just a tad heavier. Binding works the same way as with any other quad out there. There are only a couple things I’m not crazy about. First is the slow rotating speed or yaw. I’ve seen a lot of complaints about this. Even when switching to fast mode, it still rotates slow. If you’re just flying indoor then this won’t be a problem, but if you’re outside flying fast you’ll notice it more. Secondly is the height. The center of gravity is higher than the Cheerson and ProtoX and this causes it to sometimes flip upside down when landing. It really only happens during hard landings. Even with that said, the Syma X12 is still my top pick out of all the nano quadcopters. The 6-axis gyro is spot on, and makes it feel like you’re flying a larger quad. 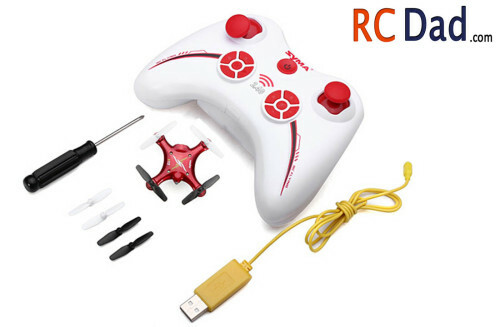 The stability along with the larger transmitter gives you more accurate controlled flying. 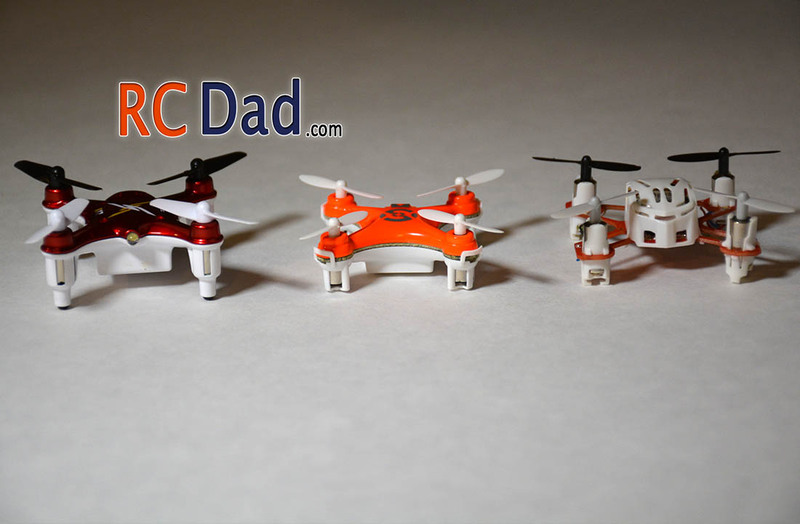 When trimmed out, it hovers in one place better than any nano quad I’ve tested. Flying outside in a straight line was no problem, almost like it was on tracks and with the bright white light in the front it’s easy to turn around and fly straight back. It will do flips but make sure to apply some extra throttle to compensate for the drop you’ll experience after every flip. The Cheerson is defiantly performs flips faster and recovers better. Flight times are average around 7 minutes with a 30 minute charge time. 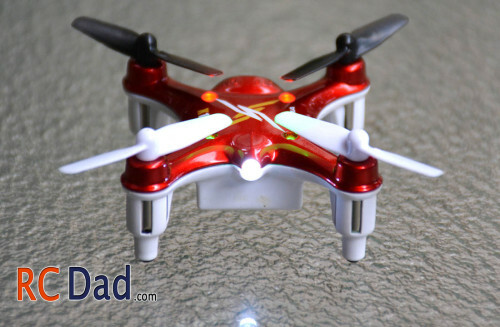 The battery is built in and that’s common with this size quadcopter. They probably design it that way to give these little motors a chance to cool down before flying again. Flying at sunset is great because the winds are usually calm and you can easily see the front headlight which helps a lot with orientation. There wasn’t much need for trimming the X12. 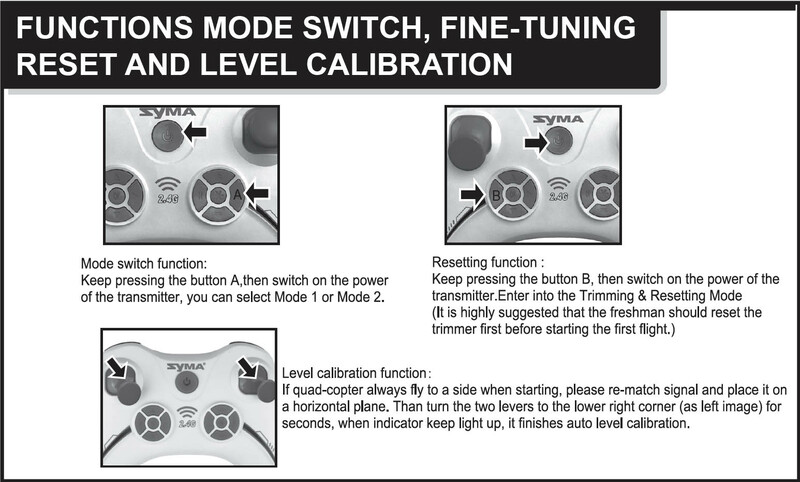 If you turn it on and set it on a flat level surface it does a really good job calibrating itself! 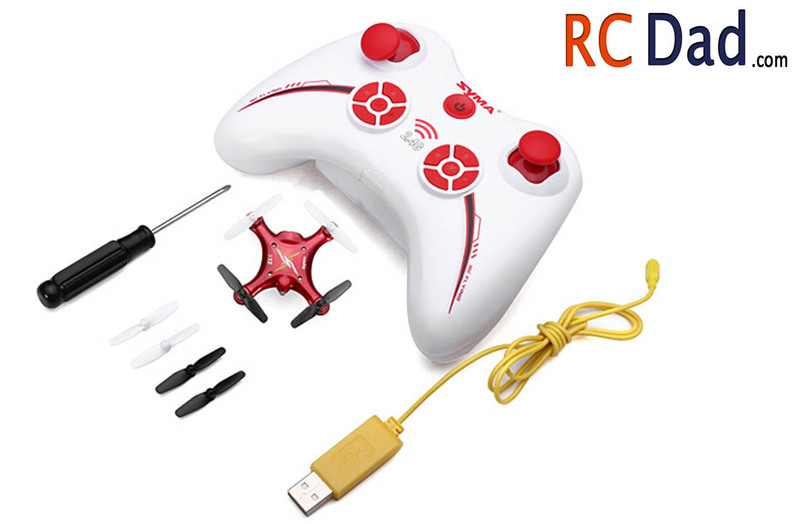 If you’re learning to fly a quadcopter for the first time, remember to fly over carpet or grass and keep it low until you get the hang of how the controls work. 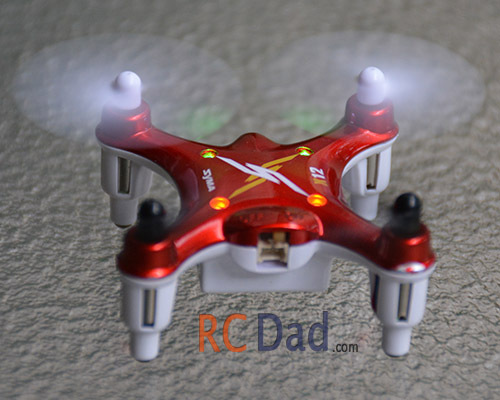 While this is one of the most rugged nano quads, it can still break if you’re not careful. Overall the Syma X12 is a great nano quadcopter. It’s what you can expect from Syma, quality and value. If you have any questions leave then in the comments below. Make sure to subscribe keep up to date with new reviews and if you liked the video please give it a thumbs up! Good bye. This is my first quad, I am the definition of a novice. I have a questino about the trim. How does it work??? Do I have to press the direction i want it to go in?? ?